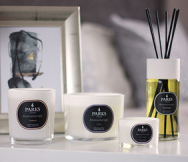 The Parks Candles All-Natural Reed Perfume Diffuser Gift Sets are known far and wide for being some of the finest and purest room scenting products available. They make the perfect gift for nearly anyone. Our strong emphasis on quality means that even many people who suffer from asthma or other breathing problems can use our perfumes without ill effects. Our chamomile, violet, orris and honey scent is a customer favourite. Just like all of our scents, it is handcrafted by our expert craftspeople and never fails to make a favourable impression. Aromatherapists tell us that chamomile is a very calming scent that aids relaxation and helps to calm jangled nerves. Its scent is at once herbal and fruity, with complex undertones that are preserved by a traditional steam distillation process. The scent of violet is considered to be not only soothing, but also inspiring. It is actually derived from the leaf of the plant and adds a distinct bright overtone to the whole. Orris is a delightful scent and aromatherapists know it to be an excellent decongestant and pain reliever. It also has a surprising floral scent that merges well with the flower-derived scents in this perfume. Honey is, of course, a lovely scent that works to bind the rest together coherently. The 100ml scent bottle included in the set is enough to perfume most homes or offices for 6 to 8 weeks when used with the included rattan sticks.